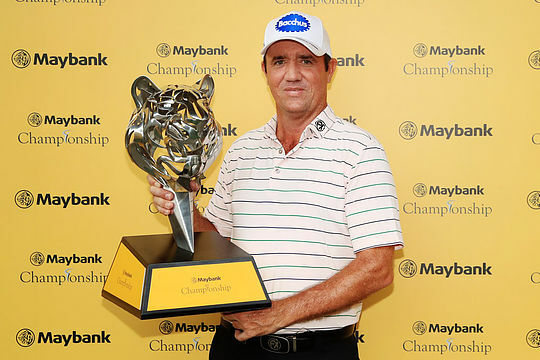 Australia’s Scott Hend returned to his winning ways after clinching his first Asian Tour title since 2016 following his dramatic play-off victory over Spain’s Nacho Elvira at the Maybank Championship on Sunday. Hend held a slender one-shot lead heading into the final hole of the co-sanctioned event but late drama ensued when a clap of thunder disrupted Elvira’s approach into the 18th green. The skies opened soon after leaving officials with no choice but to suspend the play. When play resumed about 90 minutes later, Elvira drained a monstrous 30-feet birdie putt to force a play-off with Hend, who had no answer to the Spaniard’s remarkable birdie effort. Hend got a lucky break when his tee shot on the first extra-hole hit the base of a tree and ended up on the fairway, while Elvira’s ball went into the fairway bunker. “I felt like I played fantastic on the back nine. I just had to keep my head on and stay patient, stay in there. I’m just trying to soak it all up and remember what it feels like to win,” said Hend. Hend now moves into second place on the all-time Asian Tour career-earnings list and becomes just the second player to break the US$5 million mark after Thongchai Jaidee. Elvira’s runner-up finish was his second in as many starts after he ended his recent campaign in Qatar in a tie for second. Ernie Els continued his recent return to form with a T7 finish. The 4-time major champion was well within contention but failed to make a run at the leaders across the weekend to finish five shots adrift at 10-under. Lucas Herbert and Terry Pilkadaris were next best of the Australians behind Hend in a tie for 25th place at 6-under. Zach Murray (T41), Marcus Fraser (T48) and Min Woo Lee (T57) rounded out the Aussie attack.